Enjoy weeknight meals with your family, holiday festivities, and Friday-night dinner parties gathered around this beautiful dining table. 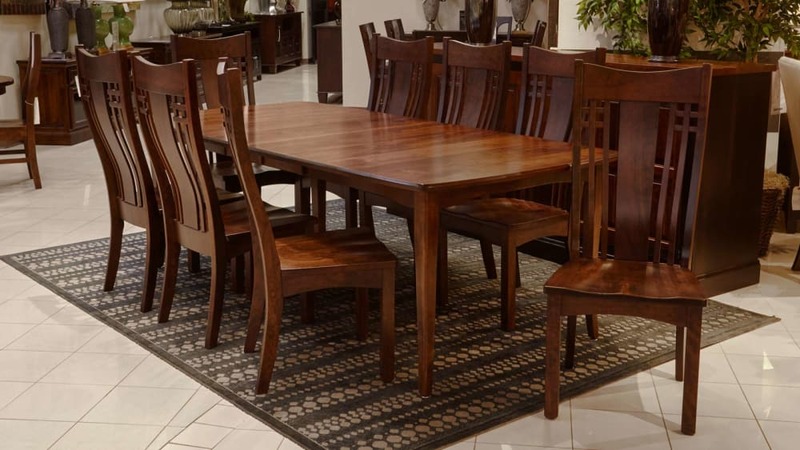 Solid cherry wood chairs make a perfect accompaniment to the solid maple wood table, and built-in leaves let you adjust the size, so you can accommodate more guests. This dining room set will ensure that any event, no matter how casual, will feel special. Skilled Amish craftsmen built this setin America! Solid brown maple and cherry hardwoods make this set a worthwhile investment. Built-in leaves let you tweak the table's size. After hours of labor-intensive sanding, the wood grain is enhanced with a rich, lustrous stain. Built from sustainably harvested, solid cherry wood, the chairs feature mortise and tenon joints and are "glued and screwed" to provide a lifetime of protection from wear and tear.